15″ x 40″ signed and painted on Masonite. Buyer pays for shipping. Buy one or both. $150 each. This bio is not current as it was written around 1980 by Donald Bonnist. G. Drummond Mansfield was born in 1920 in Seoul, Korea; his father was an MD working abroad. Drummond moved to the States and studied first in Chicago at the American Academy of Fine Art, The Chicago Academy of Fine Arts and De Paul University. He worked as a commercial artist in Chicago. He was mostly a self-taught artist. He’s had showings in the Chicago area and in New Orleans to where he later moved. One New Orleans painting was purchased for the permanent collection of the Art Gallery of Evanston, Ill. High School, one of the best galleries of the Mid-West owning originals of Matisse, Don Kingman, Max Kahn, etc. 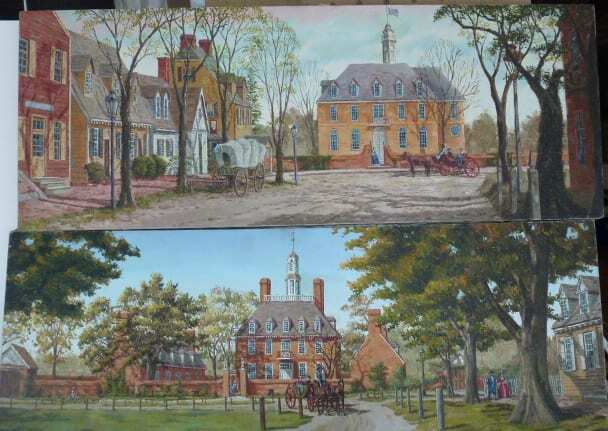 For ten years he specialized in paintings of Old New Orleans which hang in homes in every state of the Union and almost every country of the free world.